Many of us wish to be conscious of how our lives are blessed. We don’t want to be stuck in a complaint-based life. We want to be grateful. Yet we constantly regress to a state of mind where we focus primarily on our problems and complain about how hard and unfair life is. Our state of mind (and spirit) is a roller coaster, going up and down between feeling grateful and sinking into despair or resentment. The following stages may reflect where you are at any given moment. We don’t “attain” some higher stage and remain there. Instead we can develop the capacity to notice where we are and step back and simply reflect on ourselves and our lives. A moment of gratitude is also a moment of grace! Even though I am supported and cared for by others, I have no awareness of it and I spend most of the time complaining. I am somewhat aware of the care and support I receive, but I feel I deserve it and spend much of the time complaining. When something unexpected is done for me, or given to me, I am grateful, but I take most things for granted and complain quite a bit. I am frequently aware of how fortunate I am but I feel I’ve worked very hard to get here and do a lot for others. I often complain when things don’t go my way. I am aware, almost daily, of how I’m consistently supported and cared for by others and that I don’t give back nearly as much as I receive. I know I shouldn’t complain, but I do anyway. I am aware on a daily basis of how much I receive from others and how little I give back in return. I have a growing awareness of my tendency to be focused on myself and I’m conscious of the problems and difficulties I consistently cause others. I feel both grateful and guilty. Given all this, I’m amazed that I still complain so much. I’m aware each day of how much I receive from others and how little I give. I make an effort to give more to others as a result. My life is blessed and I clearly don’t deserve what I have. Whatever I have accomplished was only done with the support of others. No matter what, I still cause troubles and inconvenience to others, the awareness of which humbles me and makes me less judgmental of others. When I forget all this, I still complain. The spirit of awakening is the antidote to ignoring, passivity, and automatic routines. Renunciation and restraint are the antidotes to harmful impulses. Body-grounded awareness is the antidote to wandering in thoughts and emotions. Stable attention is the antidote to reactivity. Seeing clearly is the antidote to delusions of permanence and solidity. Undistracted non-reactive presence is the antidote to willful manipulation. Equanimity is the antidote to grasping and rejecting. Kindness, compassion, and sympathetic joy are the antidotes to fearful self-centeredness. In daytime the sun, at night the moon, each in turn does not blind the other. This is how a patch-robed monk steadily practices, naturally without edges or seams. To gain such steadiness you must completely withdraw from the invisible pounding and weaving of your ingrained ideas. If you want to be rid of this invisible [turmoil], you must just sit through it and let go of everything. Attain fulfillment and illuminate thoroughly, light and shadow altogether forgotten. Drop off your own skin, and the sense-dusts will be fully purified, the eye readily discerning the brightness. Accept your function and be wholly satisfied. In the entire place you are not restricted; the whole time you still mutually respond. Right in light there is darkness; right in the darkness there is light. A solitary boat carries the moon; at night it lodges amid the reed flowers, gently swaying in total brilliance. Pick the experience of being "the odd one out" (or the experience of being "the one who fits right in"). See if you can rest in this experience for a few breaths, for a few moments, for a few minutes. Use the breathing body as an anchor to help you remain centered and grounded as the experience unfolds. See how the experience is a actually a bundle of intertwined sensations, feelings, thoughts, impulses, and behaviors, coming and going, appearing and disappearing, ever changing. See how sensations and feelings and stories and impulses arise together, triggering and depending on and supporting each other. This is the nature of what we call "an experience." Now rest in the experience and recognize its nature at the same time. Rest in the recognizing. Consider the possibility that the experiences of "odd man out" and "fits right in" are common human experiences -- maybe even universal. Acknowledge the struggle and suffering that come out of these two experiences for you, for others, for groups, for humans as a whole. Open to our common struggle and suffering, gradually forming the intention not to act out or exacerbate these human tendencies. Consider the possibility that your willing tolerance of these difficult experiences, and your capacity to see the true nature of them, might actually save others a little trouble. As you build the capacities to do these practices, try deliberately adopting the role of "odd one out" or "fits right in" for an hour or a day. Just adopt the view that this is who you are. Without anyone else even noticing, go through your day being in that role. Don't act it out. Adopt the persona to see how it colors your perception of the world. Do this as a secret practice to sharpen your insight and test your capacity to transform your experience of yourself, of others, and of the world. Dedicate your effort and any benefits to the freedom, peace, and happiness of all living beings. "We are but whirlpools in a river of everflowing water. We are not stuff that abides, but patterns that perpetuate themselves." (Norbert Wiener, Human Use of Human Beings, p.130). Some patterns lead to suffering, some to happiness and balance. Take care. Compassion the purpose and heart of practice, with insight and clarity as methods and tools for seeing how my experience and the world around me are connected and interdependent. Rather than focusing or generating special states or attacking patterns in an attempt to get rid of them, softening and opening to the reality I'm experiencing. Bringing together the sensations, feelings, stories, and behaviors that arise: integrating, healing, whole-ing. Taking responsibility, cultivating response-ability: responding to suffering, rather than trying to fix a problem or save the world. By all means, honor your heart's aspirations and let them form deep intentions. But when craving becomes grasping, suffering surely follows. caring for all sentient beings. Invite open awareness of the totality, the universe of experience: no picking and choosing, no ignoring, no indifference. Regard yourself as the host of everything and everyone that appears: you don't control what happens but you have infinite space, infinite resources, and infinite rights, skills, and interests. Exclude no one who shows up; everyone is your guest: acknowledge their arrival, invite them in with utter enthusiasm, serve them whatever they need, introduce them to the other guests, and enjoy their presence. Act directly, freely, and quickly in response to whatever arises, without hesitation or calculation: you don't control the consequences of your actions, but you are infinitely responsive, you have unlimited capacity, free of fear, with nothing to defend. Accept all consequences and conditions, favorable or unfavorable, as equally appropriate and fitting: every situation is auspicious. Stability: awareness is open, unbounded, without distraction or dullness. Clarity: perception is vividly clear, making the finest distinctions in each thing and situation. Knowing: directly sees how everything inside and outside is equally empty, vivid, pure, and unceasing. Effective: responses are direct, free, without hesitation or conflict. Union: these four aspects of awareness~compassion arise together, inseparable, spontaneous, complete. "Free of fear" means fear is no obstacle to knowing and effective action: thoughts and emotions arise empty, pure, vivid, and transparent, like a rainbow, like a storm, like a magic show. Vajrayana practice and activity does not cancel out the other levels. Hinayana means purifying behavior and doing no harm. Mahayana means purifying intention and doing good. Vajrayana means purifying perception and enjoying. The ability to keep all three vows is power. Power is linked with joy. Joy is unconditional gratitude. Dedicate every effort and every benefit to the well-being of all. Sarva mangalam. this I offer for the welfare of sentient beings. increase in this and every future life. in the arising of every phenomenon. for the liberation of all sentient beings. Stay gently grounded in the body; disengaging physically can trigger a racing mind or conflicted heart. Just gently and naturally drop back into awareness of the body as often as possible. Exercise, eat well, and make time and conducive conditions for healthy sleep. Engage the best medical and natural healing treatments, without expecting magic or miracles. Seek the ongoing support of genuine friends; tell them you are having a difficult time and that you appreciate their understanding and would like their support. Call on spiritual, emotional, or physical energies of the universe that you long for and sense would be helpful to you. The heart-felt, wordless, intuitive calling out is itself the practice. Regard gratitude, hope, love, and awe as practices, as seeds that have manifold practical results. Invite them to arise, and notice when they do, and appreciate their power. "When I am liberated by silence, when I am no longer involved in the measurement of life, but in the living of it, I can discover a form of prayer in which there is effectively, no distraction. My whole life becomes a prayer. My whole silence is full of prayer. The world of silence in which I am immersed contributes to my prayer. "The unity which is the work of poverty in solitude draws together all the wounds of the soul and closes them. As long as we remain poor, as long as we are empty and interested in nothing but God, we cannot be distracted. For our very poverty prevents us from being "pulled apart" (dis-tracted). "Suppose that my "poverty" be a secret hunger for spiritual riches: suppose that by pretending to empty myself, pretending to be silent, I am really trying to cajole God into enriching me with some experience -- what then? Then everything becomes a distraction. All created things interfere with my quest for some special experience. I must shut them out, or they will tear me apart. What is worse -- I myself am a distraction. But, unhappiest thing of all -- if my prayer is centered in myself, if it seeks only an enrichment of my own self, my prayer itself will be my greatest potential distraction. Full of my own curiosity, I have eaten of the tree of Knowledge and torn myself away from myself and from God. I am left rich and alone and nothing can assuage my hunger: everything I touch turns into a distraction. "Let me seek, then, the gift of silence, and poverty, and solitude, where everything I touch is turned into prayer: where the sky is my prayer, the birds are my prayer, the wind in the trees is my prayer, for God is all in all. "For this to be so I must be really poor. I must seek nothing: but I must be most content with whatever I have from God. True poverty is that of the beggar who is glad to receive alms from anyone, but especially from God. False poverty is that of a man who pretends to have the self-sufficiency of an angel. True poverty, then, is a receiving and giving of thanks, only keeping what we need to consume. False poverty pretends not to need, pretends not to ask, strives to seek everything and refused gratitude for anything at all. "Far from ruining the purity of solitary prayer, petition guards and preserves that purity. The solitary, more than anyone else, is always aware of his poverty and of his needs before God. Since he depends directly on God for everything material and spiritual, he has to ask for everything. His prayer is an expression of his poverty. Petition, for him, can hardly become a mere formality, a concession to human custom, as if he did not need God in everything. The solitary, being a man of prayer will come to know God by knowing that his prayer is always answered... Gratitude is therefore the heart of the solitary life, as it is the heart of the Christian life." "[L]earning to pay positive attention is the secret formula of almost all mature religion. Any ideological, angry, or fear-based process will only reinforce the False Self. The ego always has an opportunistic agenda. The soul has no agenda whatsoever except to see what is -- as it is -- and then let it teach you." May I find the inner resources to be present for my sorrow. May I accept my sadness, knowing I am not my sadness. May I accept my own and others’ anger, fear, anxiety, and sorrow, [knowing that our hearts are not limited by these feelings]. May I accept my grief, knowing it does not make me bad or wrong. May I be open with myself and others about my experience of suffering and loss. May I find peace and strength that I may use my resources to help others. May all those who grieve be released from their sorrow. "Resting one’s mind without fabrication is considered the single key point of the realization of all the countless profound and extensive oral instructions in meditation practice such as Mahamudra, Dzogchen, Lamdrey, Cho, Zhije and so forth. The oral instructions appear in various modes due to the differences in ways of human understanding. Some meditators regard meditation practice as simply a thought-free state of mind in which all gross and subtle perceptions of the six senses have ceased. This is called straying into a dull state of shamatha. Some presume stable meditation to be a state of neutral dullness not embraced by mindfulness. Some regard meditation as complete clarity, smooth bliss or utter voidness and cling to those experiences. Some chop their meditation into fragments, believing the objective of meditation to be a vacant state of mind between the cessation of one thought and the arising of the next. Some hold on to such thoughts as, "The mind-nature is dharmakaya! It is empty! It cannot be grasped!" To think, "Everything is devoid of true existence! It is like a magical illusion! It is like space!" and to regard that as the meditation state is to have fallen into the extreme of intellectual assumption. Some people claim that whatever is thought or whatever occurs is of the nature of meditation. They stray into craziness by falling under the power of ordinary thinking. Most others regard thinking as a defect and inhibit it. They believe in resting in meditation after controlling what is being thought and tie themselves up in fixated mindfulness or an ascetic state of mind. In short, the mind may be still, in turmoil as thoughts and disturbing emotions, or tranquil in any of the experiences of bliss, clarity, and nonthought. Knowing how to sustain the spontaneity of innate naturalness directly in whatever occurs, without having to fabricate, reject or change anything is extremely rare." Countless beings are wandering, trapped in cycles of confusion and struggle. My heart goes out to them! The force of reactive emotions creates realms of suffering. There is no refuge but awakened compassion. May I fully awaken for the benefit of all beings. Through reaction and habit, the force of anger creates the hell realm. Hot anger and cold hate, attacking and revenge, what torture! Opening to this experience, knowing it completely, reaction and struggle come to an end. May we awaken to kindness and harmony. Through reaction and habit, the force of greed creates the hungry ghost realm. Hunger and thirst, craving and grasping, frustrated misery! May we awaken to generosity and gratitude. Through reaction and habit, the force of instinct creates the animal realm. Fearful hiding, seeking safety and comfort, the thick fog of dullness! May we awaken to intelligence and creativity. Through reaction and habit, the force of desire creates the human realm. Restless searching, fleeting pleasure, the stress of constant activity! May we awaken to contentment and ease. Through reaction and habit, the force of jealousy creates the titan realm. Stab of envy, furious competition, unjust defeat! May we awaken to appreciation and sympathetic joy. Through reaction and habit, the force of pride creates the god realm. Deluded pleasure of self-absorption, the shock of humiliation when it ends! May we awaken to humility, connection, and service. In all my lives, may I meet whatever arises with awakened compassion. Opening to the depths of each realm, I rest in experience just as it is. Knowing and freedom arise together; may I not take birth in the six realms again. With a heart open to the cries of others, realms are emptied and beings are freed. From seeds planted, fruit grows. Seeking to escape from pain, we may discover that others are suffering too. 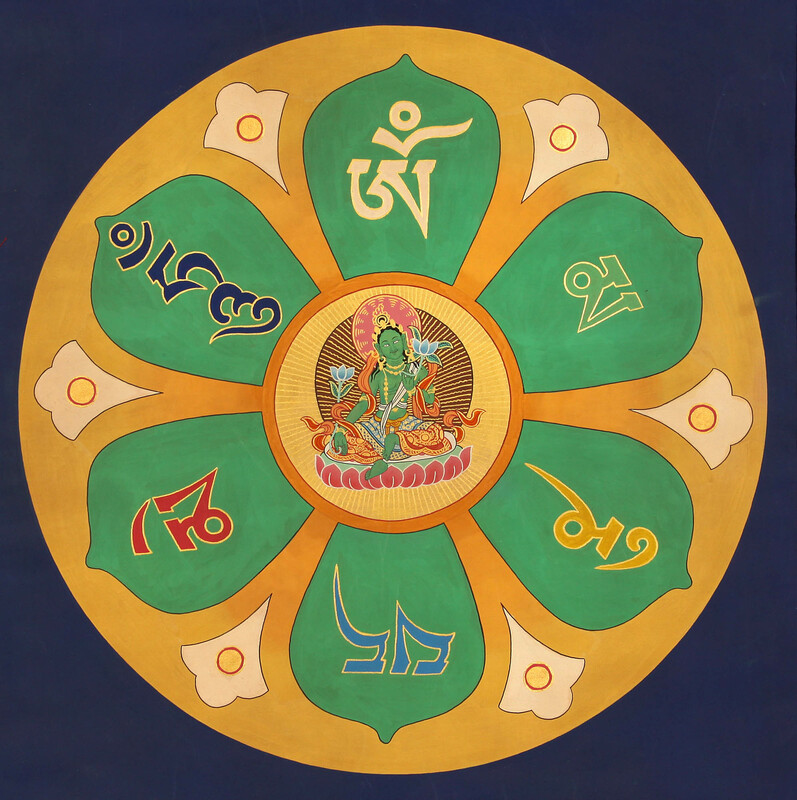 Relying on the teachings of Thangtong Gyalpo and Ken McLeod, George Draffan gathered these words to remind himself and others of a way to meet confusion and turmoil. I understand that the nature of appearances is empty. I understand that the nature of being empty is to appear. How do I live with empathy as opposed to alienation? How do I live with a sense of my own value as opposed to a feeling of deficiency? How do I live n a spirit of hope instead of fear? How to be in the world and capable of moral engagement with other human beings..."
Awareness leads to wisdom, understanding the nature of things. Compassion/kindness leads to the embracing and integrating of everything. Bodhicitta is the aspiration and intention of awareness and compassion. Shamatha is calmly abiding in whatever arises with awareness and compassion. Vipashyana is seeing clearly the nature of things (and, hopefully, naturally responding from and with compassion). The immeasurables are kindness, compassion, joy, and clarity~equanimity. Yidam is the recognition of and identification with awareness and compassion. Qigong (whether externally with limbs or internally with intention) is moving bio-energy with awareness and compassion. Awareness and compassion are the basis of every practice. We overestimate our control and underestimate our influence. Amazing how much time and energy I spend defining and defending my self, when I know so little about it. The essential life-giving vitality of land and community. The good of praying and acting in support of those protecting them. Nothing is more important. "The danger of [an illusion], because there's nothing there, is to overreact -- to that which isn't there. You're compensating for its absence." Also known as the brahma-viharas: kindness, compassion, joy, and equanimity. Friendliness toward oneself and others, wishing well: safety, health, success, happiness, peace. Empathy for pain and suffering, and wishing oneself and others be free of it. Appreciating the good in the world, rejoicing in happiness and success, one’s own and others’. Clear and balanced in pleasant, unpleasant, and neutral experience, with friends, strangers, and enemies. The bliss and stillness of stable attention (shamatha) and the clarity of insight (vipsahyana) are compelling, and extraordinarily helpful. But without doubt caring for others and appreciating the good also lead to the deepest insight, happiness, peace, and freedom. HERE is a traditional method for cultivating the four immeasurables. And HERE is a one-page version. "No one steps in the same river twice, for it is not the same river and they are not the same person." Meditation practice deconstructs dysfunctional psychological structures and behavioral patterns. Activist practice deconstructs dysfunctional social and political structures and institutional patterns. Meditation and activism at first they seem separate, even conflicting, but they are complementary -- intertwined and mutually supporting. We cannot transcend emotions or our humanity. We can transform our conflict with our humanity, to become more human, completely human, by entering our experience more fully. To do so takes a heart willing to engage the ceaseless transformation of things, one of which is ourselves ~ a ceaseless flow of experience arising. What appears to be permanent is always changing. What appears to be separate is intimately connected. and what arises as suffering becomes peace and joy. The Lankavatara Sutra says: Samsara is like an illusion or a dream ~ and karma is relentless. Fight injustice, not people. Everyone deserves respect; the point is not to “win,” but to build relationships. Nonviolence will always improve things down the line; violence—of any kind—will always make them worse. Basic human needs are universal; at the root of every conflict a “win-win” solution is possible. Each of us has a piece of the truth, none of us has the whole truth. Never show disrespect to another’s person—or accept it yourself. Nobody can degrade you without your permission. The willingness to take on suffering rather than inflict it and relentless persistence in a right cause bring out the power of nonviolence. Nonviolence has two modes: in obstructive program we stand in the way of wrongdoing—in constructive program we lead the way in creating solutions. Never give up on another human being. If you assume people are rational, it helps to awaken their rationality. Cling to essentials (like your human dignity); be willing to compromise on anything else (especially if it’s just a symbol). Do not yield to threats. Ask yourself: “What are they holding over me?” Renounce that, and you are free. When nonviolence succeeds there are no losers; gloating over “victories” can actually undo what we have gained by nonviolent action. Space opens up when we recognize that things are not permanent or solid or fixed. Compassion remembers the suffering that comes from not recognizing. The light of awareness and the light of compassion are the same light. Seeing that things are empty of permanence and solidity, compassion arises. With compassion for oneself and others, insight arises. Gaining confidence in compassion and awareness, faith arises: all experience is flowing and flexible, an unceasing interaction between beings inherently sensitive and responsive. Through the power of dualistic fixation I wander in the realm of existence. May ignorance and confusion be completely resolved. When we know the actual nature of what's arising, we can make choices that lead to freedom and happiness rather than choices that lead to struggle and suffering. We look into what’s arising and we see that it’s actually just a flow of passing sensations, feelings, stories, and actions. What appear to be “real objects” are actually just "external" sense perceptions. What appear to be “real emotions” and “true thoughts” are just "internal" experiences. When you can relax and settle into the unceasing flow of sensations, feelings, and stories, then try looking into what experiences. Look at a sensation or a feeling or a thought. Then look at what experiences that sensation, feeling, or thought. "What is aware" is actually just another experience. We habitually mistake awareness for a self, but it turns out to be a compelling combination of sensations, feelings, and stories. The "self" is empty of permanence and solidity. The “self” is also empty of separateness: it always arises in the context of a situation, in interaction with an “object” or another "self." Is this not true? Don’t just analyze or try to determine whether these are logical statements. Test again and again how your experience actually arises. Be sure, in your own direct experience. Our senses of self come and go, depending on the situation or role we’re in. We walk into work and become a colleague or employee. We get together with friends and become another particular self. We interact with family and another self arises -- a father or mother or son or daughter or sibling. We habitually mistake the passing experience(s) of "self" for something solid, some thing that needs to be defined and defended. Lots of suffering there. When we really see and understand the nature of suffering, how it arises from confusion and clinging and aversion, we care about what happens. In insight practice we are not trying to generate a particular sensation or feeling or thought; we are trying to see clearly (vipashyana), to know the actual nature of all experiences, so that we can free ourselves from the confusion, attachment, and aversion that create so much suffering for ourselves and others. Of course if we don’t notice the suffering, or we don’t care about it, we may not have the incentive to look deeply. So alongside insight practice is the equally (or more) important practice of interacting with others in the world: the practice of kindness, compassion, generosity, ethics. Insight leads to compassion. Compassion leads to insight. Neither insight nor compassion are complete unless the other arises. If we focus exclusively on compassion, we may take things too seriously and end up embroiled in trying to save or fix the world. If we focus exclusively on insight, we can take things too seriously and end up lost in a tangle of thoughts, or pursue special states of mind. Better to practice insight with the motivation of compassion, and practice compassion with clarity of insight. And into the footpaths crisscrossing the plain. Which wind, which cloud is without its response? Have all been merged in our lives. Are the dense fog blanketing a city. To become the lives of the travelers on the paths. as I would with a mischievous child. By the gong of time you live. why not be a little silent now? Hush yourself, noisy little man. hush and you were born. the same hush you came from. Giving up attachment to the world does not mean that you set yourself apart from it. Generating a desire for others to be happy increases your humanity. As you become less attached to the world, you become more humane. As the very purpose of spiritual practice is to help others, you must remain in society. Look at any experience as it arises, whether it's an "internal" sensation, feeling, or thought, or an "external" object. Just look into it, and recognize it as a sensation, feeling, thought, or perception. Then look at what is aware of that experience. Just look into the awareness, recognizing it as awareness. Try going back and forth, from the experience to the awareness, back and forth, with curiosity, to know clearly the nature of experience and awareness. "Don't rush to finish. You don't yet know what this event is for. Give happenings time to find themselves." To speak gratitude is courteous and pleasant. To enact gratitude is generous and noble. To live gratitude is to touch heaven. While doubt isn't a very pleasant condition, certainty is absurd. “The days and nights are relentlessly passing. How well am I spending my time?